Why no add a personalised ribbon to your flowers. 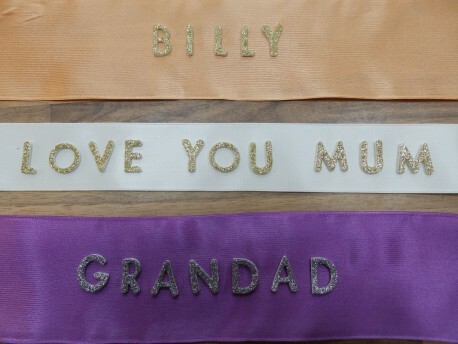 Ribbon can be your own choice of colour, and the letters come in Gold or Silver. Any name, word or saying can be made. We charge per letter on the ribbon at 0.35p per letter. you just specify the ribbon colour and whether you want the letters in Gold or Silver. Only available as "an add on" to any flower order.